Do you ever dream about food? I do. Not like during sleep dreams but just day dreaming. I need a break so I am going to think about food. Foods I want to make. Foods I want to eat. Foods I want to shop for. Food. Food. Food. It makes me pretty happy. Lately these dreams have been about waffles. Mainly chocolate chip waffles. I couldn't get them out of my head. The other day I had finally had enough and needed to make chocolate chip waffles. Like right that very second. Of course Mr J gladly joined in. They were one of those meals that ends up way better than expected. You know it is going to be good but then when the chocolate melts into the batter and the warm maple syrup. Maybe it was all the anticipation? Heat a waffle iron according to your manufacturer's instructions. Mix the dry ingredients together with a whisk, stirring in the chocolate chips last. In a separate bowl mix together the wet ingredients, milk, the cooled melted butter and the eggs. Whisk together. Combine the wet ingredients with the dry ingredients. Mix until just combined. There can be a few lumps in the batter; you just don't want any dry patches or big lumps. Pour the amount of batter specified for your waffle iron onto the preheated waffle iron and cook according to your instructions or until the steaming stops. In general, if the steaming has dramatically slowed down and you can easily open the waffle iron to remove the waffle without it sticking, it is most likely done. True story: In the early morning hours of March 18, 1990, two men dressed as police officers bound and gagged two guards at the Isabella Stewart Gardner Museum in Boston, Massachusetts, and stole thirteen works of art worth today over $500 million. Despite thousands of hours of police work and a $5 million reward, the artwork has never been recovered. The Art Forger dives deeper into this story with two fictional characters, a gallery owner and struggling artist, that find themselves in the middle of this mystery. Did they really have in their possession one of the missing pieces? I read this book in two days. Granted it was the long weekend I was not as pressed for time as I might normally be, but it was very hard to put down. If you are looking for a good beach read I highly recommend this book. It feels like Tuesday but really it is Wednesday. Don't you love short weeks? I do. Yesterday was all sorts of ups and downs at work. Thankfully it ended on an up otherwise I would be rather cranky writing this post. Mr. J and I stayed home this past holiday weekend and had all sorts of good eats. Too many good eats according to my now snug pants. One morning we had breakfast at a little place right down the road. The food is so good and reasonably priced. I debated between the egg sandwich and an omelet. I ended up with the omelet filled with goat cheese, sausage,and asparagus. Yum, yum. Lunch was hot dogs, cause, well sometimes you need a good dog. I toasted the buns a bit too much. I swear our toaster oven goes from nothing to burnt in about 30 seconds. And you have to realize that those 30 seconds never happen when you are standing there. I made up for it though with this special sweet and spicy corn relish topping. The name says it all. There are jalapeno pieces and crushed red peppers for the bite of spicy but then the dressing has honey. You truly get a some sweet and spice in every bite. In a medium bowl whisk together the olive oil, red wine vinegar, honey, cumin, salt, and red pepper flakes. Add in corn, green pepper, onion and tomato. Toss lightly together. Cover and set aside till ready to serve. May be made up to one day in advance and stored, refrigerated, in an air tight container. Other meals included a Friday night out. Nothing like a strong cocktail and salad to end the week and start a long weekend. Another sandwich for lunch with a chicken parmesan sandwich and salad. You cannot tell from the photo but there is all sorts of chicken, cheese and sauce stuffed into that roll. Finally we had burgers. I called these the 1,000 calorie burgers. I thought it was a joke until I actually started thinking about what was in it. 1,000 calories is probably a reasonable estimate. Scary! Sauted onions and green peppers. Stuffed between a sesame seed bun. They totally need a new name. I would like to call it the Man's Burger. Somehow the eggness screams more man than woman to me. It was my first egg burger. Have you ever had an egg on a burger? This weekend I was so excited to be outside and grill. Unfortunately the weather didn't cooperate for most of the weekend. However, I was prepared. Salmon burgers are something I have always wanted to try out. I love salmon. Why not put it in burger form? What stopped me was the possibility of mayonnaise. I hate the stuff and am completely grossed out by it. For me, ordering salmon burgers in restaurants really wasn't an option. 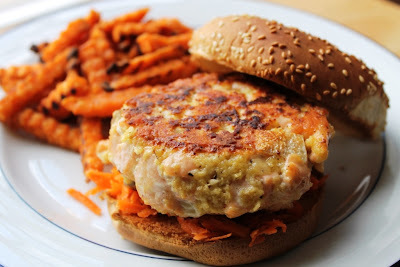 I liked the idea of salmon burgers, kind of like crab cakes, but in reality it wasn't going to happen. In stores, they looked nice but the $4 a pop price tagged stopped me again. This month in Real Simple they had an article all burgers, traditional and not so traditional. In it there was a salmon burger, no mayonnaise. Although I didn't read the direction enough to plan for the 30 minute chill time before cooking, (a little snack helped us make it to the end of the chill time) this recipe was a winner. The salmon taste was there with just a few extra hints of flavor. The carrot slaw added crunch to the smooth salmon. This was an awesome burger sure to be made again soon. Mix together the carrots, jalapeno, vinegar, oil and 1/4 teaspoon salt in a medium bowl until combined. Set aside. In another medium bowl, gently mix together the salmon pieces, ginger, scallions, bread crumbs, egg, 1/2 teaspoon salt, and 1/4 teaspoon black pepper using your hands. Form the salmon patties (about 3/4 inch thick). Make a shallow well in the top of each patty. At this point they will still be fairly messy, holding but loosely. Place on plate and refrigerate for 30 minutes. The refrigeration process will firm up the patties. Heat frill to medium high. Grill the burgers until opaque throughout, about 5 minutes per side. Stack the burgers and carrot slaw between the buns. I honestly don't know where the month of May went or springtime in general. Memorial Day is here and that means summer. Today also mark's the Secret Recipe Club's May post. I had Jess from Flying on Jess Fuel. I have actually read Jess' blog for a while now after finding it first through the Secret Recipe Club posts. I was pretty happy when I was actually given her blog to explore even more. I ended up making Jess' taco salad but the Crock Pot Thai Pork was a very close second. Typically Mr. J is not too keen on having salads for dinner. As in salad and nothing else to go with it. I assured him though it was be plenty and he finally agreed once I told him it was full of ground beef and black beans. We had this salad a few weeks ago when the weather was hot. Made on a week night it was super easy and quick to throw together. The original recipe calls for a dressing of sour cream and salsa mixed together. I actually thought I had sour cream but it turned out to be spoiled. Thus, my version used only salsa as the dressing. It was still very good but the sour cream would have been a good addition. This fed us both till we were full and still had some left over. I used the remainder in a tortilla wrap for a burrito type lunch the next day. Thanks Jess for such a good and healthy recipe. Cannot wait to try the pork out next. In a large bowl, place half the lettuce and half the veggies. Top with half the salsa. Top with the meat and bean mixture . Reserve a little bit for decorating the top. 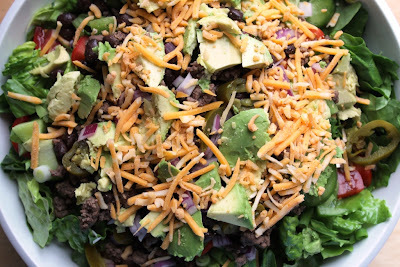 Add the rest of the veggies, dressing, and cheese and meat mix if you reserved some. I hope everyone is having a wonderful weekend. Despite the rainy,cold weather on Saturday Mr. J and I have been enjoying ourselves and eating lots of delicious foods. (I managed to sneak in two free hours to watch Safe Haven) Hopefully tomorrow the sun will shine brightly all day and we can go hiking for a bit. Today is Friday. I am super excited this week has been too long. Plus an added bonus, Monday is a holiday. Score! Memorial Day also marks the beginning (unofficial or not) of summer. Summer means lots of beach reading, vacation reading, fun reading. No Easy Day came out a bit ago but I just read it last month. Although there were some cheesy lines, I found the account of life as a Seal Team member as well as the events surrounding the Osama Bin Laden mission extremely fascinating. The Burgess Boys by Elizabeth Strout (the same author as Olive Kitteridge) is about grown up siblings brought together again by a family tragedy. Now adults the family deals with finding balance between the past and the present as well as the people they have become. The book is based in Maine. Although the characters are fictional, the events taking place are real events in recent years. Being from Maine, I found the perspectives and the peoples reactions through Strout's eyes fascinating. The book is a bit depressing which I didn't realize until I was halfway in. Good book but don't take this one if you are in the mood for something light. The Aviator's Wife is a story Charles Lindbergh's wife as seen through her eyes from the moment they first meet through all of the ups and downs of their marriage. The books highlights the gifts and strength of Anne as well as the history and feelings of the country during this time. 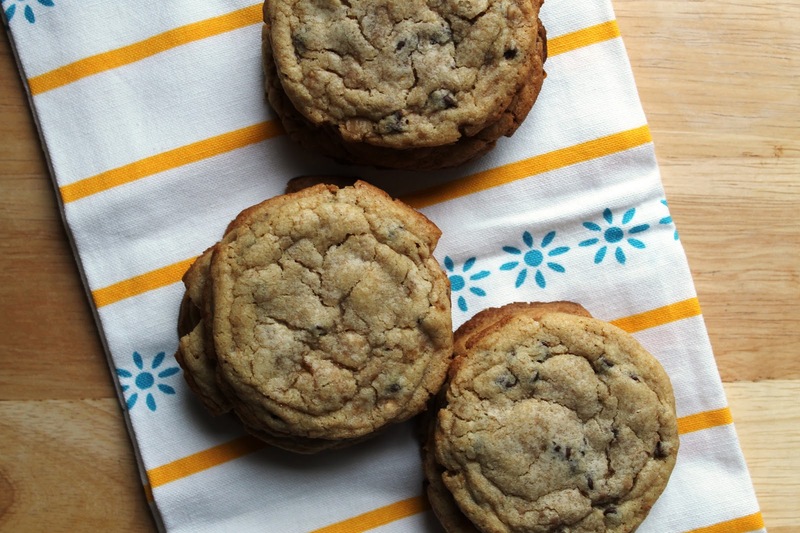 Today is the recipe post I am now most excited for all month. It's Pass the Cookbook Club day. Each month a new cookbook is picked from the shelf, the dust wiped off, and three recipes are chosen. This month for the Pass the Cookbook Club post Kita chose frozen treats from Slushed. I had never heard of this cookbook but was super excited to check out the frozen treats. My ice cream maker and I are long distance friends. We only see each other on rare occasions. These times are fun but don't last long. I am hoping this year those rare occasions turn into frequent visits. 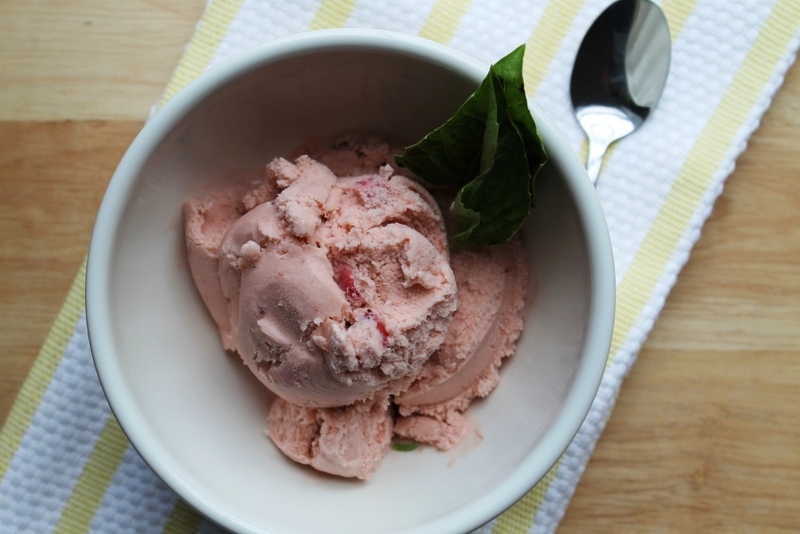 Although the process for the strawberry basil gelato recipe took me about 3 days to complete it was well, well worth it. One bite and the "ah that was delicious" statement was out of my mouth. The basil flavor is strong but pairs perfectly with the strawberries. Beautiful color. Creamy texture. Too bad I finished it before Memorial Day weekend. To read more about how the cookbook club works, see February's post from Kita - Pioneer Woman’s Herb Roasted Pork Tenderloin. To join the club, check out the facebook group. Macerate the strawberries by putting them in a bowl and tossing ¼ cup of sugar. Set aside for 30 minutes. Whisk the egg yolks and the remaining sugar in a large bowl. Set aside. Combine the milk and cream in a medium-sized sauce heavy bottomed pot. Cook over medium heat, stirring occasionally until the edges just start to bubble. Remove from heat. Stir in the basil. Cover and let the mixture infuse for 10 minutes. Strain and discard the basil leaves. Slowly, drizzle the hot mixture into the egg yolks, whisking constantly. Return to the pot. Cook over medium heat, whisking constantly, until it registers 170 degrees F on a candy thermometer and is thick enough to coat the back of a spoon. Strain the mixture into a large bowl. Whisk in the strawberry preserves, liqueur, and sliced strawberries with syrup. Cool in an ice bath, whisking frequently to drop the mixtures temperature. Refrigerate until chilled, 4-6 hours. Process the mixture in your ice cream maker according to the manufacturer’s directions. Transfer to a container and freeze overnight. It is Wednesday and feels like it should be Friday. Monday was the worst ever. Seriously. Tuesday wasn't so hot either. Hopefully today will be better. Sunday we ended up having a later breakfast that included eggs, bacon, a leftover jalapeno cheddar cheese corn muffin, and strawberries. I guess it was more of a brunch given the amount of food and timing. Lunch was stuffed Italian bread. Have you ever heard of such a thing? I had no clue until moving to Connecticut. There are tons of people here with Italian heritage around us. Thus there are also tons of Italian restaurants and delis. A staple at all of these food stores is stuffed Italian bread. Think a pizza rolled up with no sauce. Filling options are endless. Still not sure what the difference is between a Stromboli and stuffed bread. In a medium saute pan, heat 1 Tbsp olive oil. Add onion and cook until soft. Top with chopped spinach and heat through. Remove from heat. Roll out pizza dough to a 9X13 rectangle. Spoon spinach mixture on top of dough, leaving a centimeter of space to the edge of dough. Layer pepperoni slightly overlapping on top of spinach mixture. Cover with mozzarella cheese. Gently roll dough into a cylinder and tuck edges in on ends and press closed. Place pizza dough roll on a cookie sheet with seam side down. Bake until cooked through and dough begins to brown, about 25 minutes. Allow time to cool slightly before slicing. This was fun to snack on around lunch time. I also loved the swirl of colors. I was being super wife and added pepperoni. No my favorite but Mr. J loves it. Dinner I was on my own and had take out. A house salad and half a chicken parmesan sandwich. Remember what I said about all of the Italian restaurants. Well, we live about 100 feet from one. Oh so convenient when you want take out. Is there a specific type of restaurant that you have more of around you? Do you enjoy that type of food? I was in the mood to be in the kitchen as much as possible this weekend. Long time, no cook, for me. I don't like it. I had plans to make ice cream. A fancy ice cream that after reading the recipe I realized would take me the better part of two days to finish. Mr. J was already question the dessert options so I knew the ice cream would not work. Thus cookies were in order. 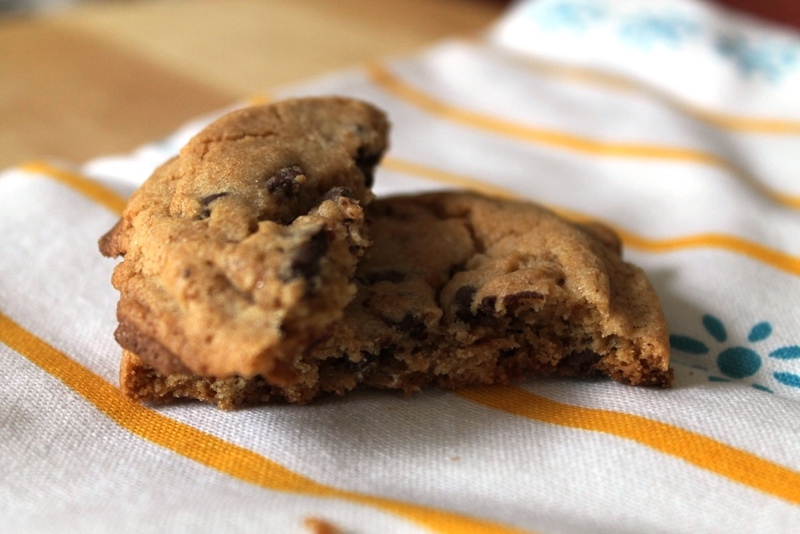 I missed National Chocolate Chip Cookie day last week. In order not to upset the cookies gods I decided I better make some fast. I upped the ante with extra toffee bits I had in the pantry for an extra punch of goodness. Each time I go for one I end up with two. I am not the only one. Mr. J makes a whole mini meal with a glass of milk to boot. Beat butter, sugar, brown sugar and vanilla extract in large bowl until creamy. Add egg, beating well. Gradually beat in flour mixture. Stir in chocolate and toffee pieces. After a tour of Las Vegas we are now back to regularly scheduled programming. As a special treat I have a real winner for you. These muffins are fantastic. We overindulged a lot in Las Vegas. Mr. J and I decided once back we would cut back on the amount of rich food we consume. At least for a little bit. These muffins are very flavorful. With sharp cheddar cheese and the bite from the jalapenos your taste buds will be having a party in your mouth. We had these as a side with a taco salad. Instead of having lots of tortilla chips we had a muffin. They added so much to the meal, making it filling and satisfying for Mr. J while still having a salad. These are best served the day of but we heated them quickly in microwave the next to serve with eggs at breakfast. Preheat oven to 375 degrees. Grease well a 12 cup muffin tin and set aside. In a medium bowl, whisk together flour, cornmeal, baking powder, sugar, and salt. Set aside. Add the wet ingredients all at once to the dry ingredients. Stir to incorporate. Before the mixture is entirely mixed, add the grated cheese and diced jalapeno. Stir to incorporate making sure that the mixture is evenly moistened and the cheese is well distributed. Divide batter between prepared muffin tins. 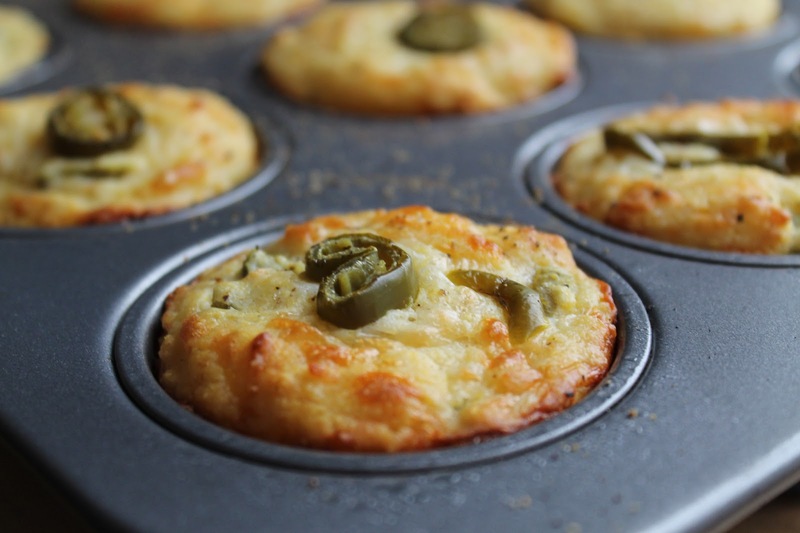 Top each with a jalapeno round. Bake muffins for 20 to 25 minutes, or until golden brown and cooked through. Muffins are best served warm.